1900/72 Photo Gravure NATIVE AMERICAN INDIAN Warrior Arapaho EDWARD CURTIS 11x14. Since 1989 - The Name You Can Trust For Fine Vintage Photogravures, Photographs & Antique Prints. Serving the Design & Decor trades for over 20 years. See our vintage and original prints featured in. And other fine quality publications. WE LIST DOZENS OF NEW ARRIVALS EVERY DAY! Where you can search our World Class Selection of authentic vintage prints by photographer or subject. Browse THOUSANDS of fine vintage photography prints from silver gelatin to photogravure. This Vintage 1972 Photogravure Comes Professionally Dry Mounted On 11 x 14 inch White Archival Presentation Mat Board And Is Ready To Place In A Standard Size Frame. 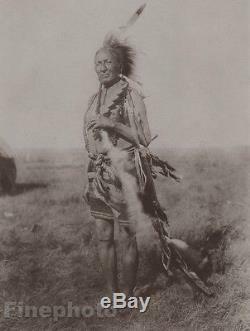 Curtis (American, 1868 - 1952) - renowned photographer of the American West and the Native American Indian. Title: "Old Arapaho Warrior" Subject: Native American Indian - American West - Tribe. Date Of Negative: circa 1895 - 1918 Type Of Print: Authentic Sepia Toned Sheet Fed Photogravure made directly from the original circa 1895 - 1918 Edward S. Date Of Print: 1972 Original Issue: Bound sheet fed photogravure compilation issued in 2 sided gravure (imagery on verso). Paper: Mohawk Superfine Paper - medium weight rag type art paper, matte finish. Meriden Gravure Company - Meriden, Connecticut Print Origin: U. Approximate Image Size Inches: 9 x 7 inches Approximate Image Size Metric: 23 x 18 centimeters Mount Board Size Inches: 11 x 14 inches Mount Board Size Metric: 28 x 36 centimeters Mount Board Color: White Print Border: No - full bleed print. Condition Grade: Fine + + Verso: Professionally dry mounted with Bienfang archival materials onto sturdy 4ply museum mat board. Registered Vintage Archive Serial #. Vintage 1972 photogravure print on fine art paper made directly from the original circa early 1900's photogravure plate/negative by the renowned photographer of the Native American Indian, Edward S. The photogravure plate is professionally dry mounted on 11x14 archival museum mat board and ready for a standard size frame. These iconic Native American images have been faithfully crafted in fine sheet fed photogravure (also known as Héliogravure) by The Meriden Gravure Company and matched for tonality and color - their "look" is that of the original pre-1920 gravures. Soft, muted and atmospheric, these images evoke the historic feel of a world and way of life long since gone. The source originals from which these vintage 1972 prints were made came from the Pierpont Morgan Library's Curtis collection and the Boston Public Library's set of original Curtis photogravures from his landmark project "The North American Indian". Finephoto carries an extensive selection of vintage 1972 Edward S. Curtis prints, in both fine lithography and photogravure - all are matched to the original images in their look. Condition of this professionally mounted photogravure is excellent and it will frame up beautifully for display. This vintage 1972 photogravure is guaranteed to be authentic and comes with a hand signed CERTIFICATE OF AUTHENTICITY (COA) with unique individual registered serial number from the Finephoto Archive & Database. Under magnification this plate shows a tight "honeycomb" cell structure, uniform pressing of ink and a wide range of tone - all indicative of a high quality sheet fed gravure plate. The watermark word "Finephoto" does not appear on the actual print. We list beautiful original vintage photographs, photogravures and antique prints everyday! READY FOR FRAMING & DISPLAY! - The expensive engraved copper plate photogravure process and the resulting fine prints make vintage photogravures highly collectible and excellent vintage prints for framing. Your vintage print will arrive ready to be placed directly into a standard size frame. While most of our clients frame our quality mounted vintage prints right out of the box exactly as delivered, you also have the option of adding an overlay window mat in the color or style of your choice which can be inexpensively done with a quick visit to your local arts/crafts store or framing shop. Secure archival packaging includes water/tear resistant carrier, custom made 275 lb. Triple wall inserts, individual acid free black archival backing boards, individual ultra clear heavy duty archival print protectors and a hand signed Certificate Of Authenticity (COA) from Finephoto. To supplement and replenish those holdings we are regularly acquiring new collections and portfolios from around the world as opportunities present themselves. As a result of this ongoing procurement of vintage materials, when we feel we are "deep enough" in specific areas we will be open to accept offers which are reasonably close to the listing price of an item. So, if you decide to use the Best Offer option in those listings which contain one and make us a reasonable offer, we will do our best to accept. At Finephoto we are always 100% committed to your complete satisfaction! We will continue striving to bring you the very best in quality, variety and excellence in photographic imagery for your collecting and photographic art needs. Where you can also sign up for our free newsletter for special promotions, new listings and interesting information on vintage photography. Unauthorized copying or use of ANY PART of this description is prohibited. (Please remember this is a large piece and requires special packing materials and procedure to ensure adequate protection during transit). Remember this is a large piece! DO NOT DUPLICATE OR COPY! The item "1900/72 Photo Gravure NATIVE AMERICAN INDIAN Warrior Arapaho EDWARD CURTIS 11x14" is in sale since Sunday, May 18, 2014. This item is in the category "Art\Art Photographs". The seller is "finephoto" and is located in Tampa, Florida. This item can be shipped worldwide.